On Thursday night, Roman Catholic did what only one other Catholic League team has done in 83 games – defeat Neumann-Goretti. With Drexel University-bound Rashann London scoring 17 points, and fellow guards Tony Carr (15) and Penn State University-bound Shep Garner (14) also reaching double figures, the Cahillites stunned the defending champion Saints, 71-64, at Philadelphia University. Leading 63-61 late in the fourth, Roman was a perfect 8 for 8 from the foul line down the stretch. The win snapped a six-game losing streak to Neumann-Goretti, which had won 14 league games in a row since watching its ridiculous run of 67 straight wins end at the hands of La Salle last year. That was the quality that led Bishop Shanahan to an impressive 49-46 victory over Kennett High in a hard-fought nonleague contest last week, thus improving the Eagles’ record to 10-6. Entering the game after having lost in overtime to West Chester Henderson less than 24 hours earlier, Shanahan emerged victorious behind huge performances from Pat Corcoran and Mike Booth. When Corcoran wasn’t scoring, teammate Booth was supplying the offense. Aided by two clutch three-point shots, Booth finished with 13 points. Doug Costin added six points. Leading by 32-20 early in the third quarter, it appeared as though Shanahan was home free. 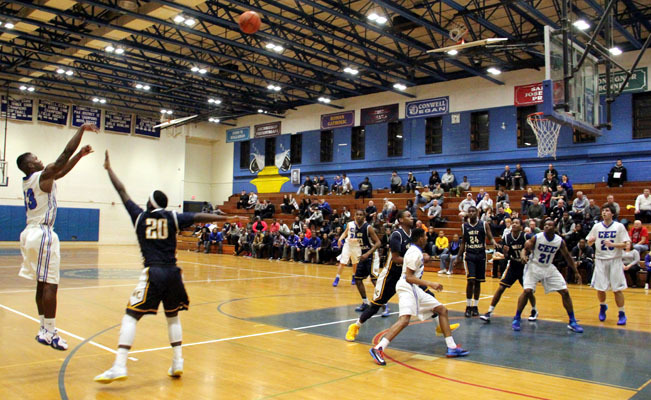 But Kennett (8-6) outscored Shanahan by 17-7 and trailed, 39-37, heading into the fourth quarter. From that point, Shanahan’s defense suffocated Kennett to the tune of 2 for 12 shooting from the floor in the final stanza, and an 8-0 run, courtesy of two baskets by Corcoran and one each by Booth and Costin, ultimately clinched the triumph. On Sunday, Shanahan won yet again, stopping Downingtown East, 63-49, to improve to 11-6 overall. Sometimes it doesn’t matter how many points a player scores. Take, for instance, Holy Ghost Prep’s Matt England. In a battle for first place in the Bicentennial League, England poured in 29 points, highlighted by a torrid 15 of 17 shooting from the foul line. But it wasn’t enough as the Firebirds lost to Church Farm, 62-55. Andre Puleo scored nine in the defeat. In a recent Catholic League tilt, Brendan Horan scored 23 points, leading Archbishop Ryan to a 59-43 victory over Bonner-Prendergast. Horan scored 17 of his game-high total in the first half, as the Raiders captured their first Catholic League win of the year. Ryan’s Austin Chabot contributed 11 points and seven rebounds.